Grabau International is delighted to announce the price reduction of the 1991 J Boats J/44 ‘LORCA J’. • Extensive cruising and racing sail wardrobe. Alongside her cruising inventory she also has and extensive sail wardrobe including a racing mainsail which has been use in anger at only two events. Sail wardrobe includes 4 genoas, 3 spinnakers and a full set of storm sails. Used predominately for family cruising she is lacking the normal battle scars found on performance boats of this age. 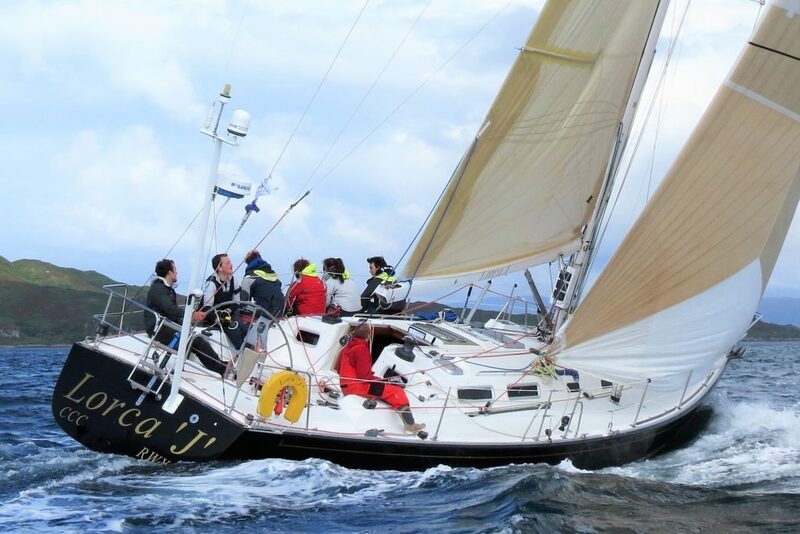 “Since purchasing “Lorca J” and sailing her up from Lorient in Brittany in 2004 my wife and I, along with our four young children spent the next ten years racing and cruising on her on the West Coast of Scotland. An early success with just five children aged between six and twelve as crew was winning the Caledonian Trophy at West Highland Week. All family holidays have been spent cruising and occasionally racing on her until about eight years ago. As the children have grown up and gradually moved on, my wife and I have spent more time on her sailing two up. Although she is a big powerful boat to be sailed two up I personally have enjoyed the challenge. Over the years I have refined some systems aboard to facilitate easier short-handed sailing. We are now at a stage in life when we feel with some reluctance that a change is needed for easier loads on older muscles. Thus we are looking for the next owners to look after her and enjoy; what I in my 59 years of sailing, deem to be easily the best all round performing sailing boat I have ever known. J/44 was inspired by an analysis of the 1988 Newport to Bermuda Race which determined that dual-purpose racer/cruisers between 41 and 45 feet were the most popular offshore type and size. Since introduction, J/44 has become the most successful large, offshore American yacht design ever, with a total of 67 boats launched. Owners in 14 countries have amassed an enviable record of ocean passages, regatta wins and logged numerous cruising adventures. Superior design and construction mean better performance in the most demanding offshore conditions. J/44s won the 1991 Fastnet Race (IMS Overall) and the 1992 Sydney-Hobart (IMS-1). Five J/44s beat all Swan 48′ -61′ upwind in a rough race to Bermuda in 1990. J/44s slide through waves with little pitch and roll, responding effortlessly to your touch on the wheel. These superb sailing and handling qualities are different from traditional cruising and IOR / IMS “rule” boats in two very important ways. J/44s have a balanced hull design with a long waterline relative to beam (L/B) providing directional stability in large waves – not compromised by need for a better rating or the added wetted surface of long keels and skegs, and J/44s have a low center of gravity and low moments of inertia – achieved with a deep lead keel, hand-laid Baltek-cored hull & deck construction and a beautifully engineered Hall rig. J/44s sail well in the extremes: downwind in light air and upwind in a blow. This means more sailing, less motoring and safe passages. Conceived in the garage of Rod Johnston the J24 design started the J-Boat company. With a $20,000 investment by his brother Bob J-Boats came into being in 1977. Since that time the company has sold more than 5000 of J24 design along side another 7000 other J-boats ranging from the J22 to J65. While not producing boats in massive volumes like other builders J-Boats have dominated the popular racer cruiser market. Producing designs that perform well on the race course while being comfortable and easy enough for a family to cruise or day sail. Since 1988 the younger generation of Johnston’s have been at the helm of the company with a total of six sons of the founders now sitting on the company board. Do you have a yacht like this to sell? Grabau International are always looking for new high-quality yacht listings both in the UK and internationally. For further information about our tailored brokerage services, please look here or feel free to contact us.